Big fun at The Dinosaur Place! 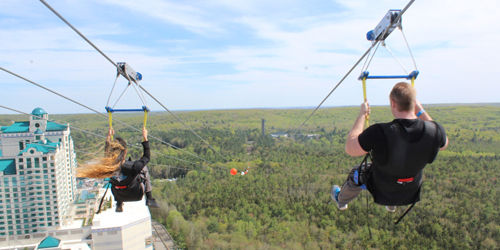 The Dinosaur Place at Nature's Art Village offers a 60 acre outdoor adventure park with over 40 life-sized dinosaurs spread among a mile and a half of pristine nature trails. Children will love getting lost in the a”MAZE”asaurus and playing on Monty’s playground featuring the SpaceNet, a 15 foot tall three-dimensional swinging, vibrating, climbing web. During the summer, cool off in New England’s largest SplashPad. 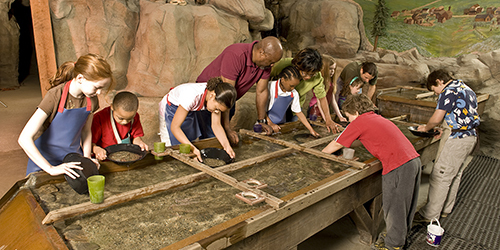 Indoor adventures await in Discovery Depot at Nature’s Art Village where guests can dig for gems, pan for “gold” and unearth dinosaur bones. Bring a picnic or enjoy great food at the Cobalt Café and other locations. 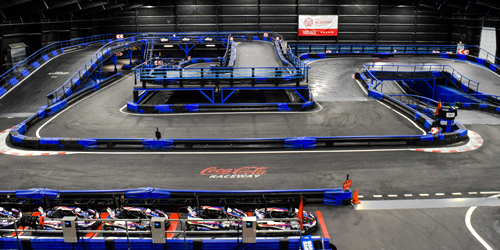 Plan an indoor or outdoor birthday party, scout, school or recreational group outing. 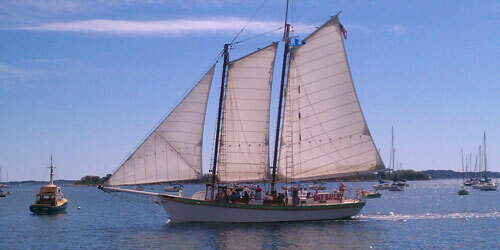 Return to the romantic Age of Sail aboard the 81-foot schooner Argia. She is a US Coast Guard-inspected vessel and one of the last sailing ships in New England. We're docked in Mystic, Conn., and sail in Fishers Island Sound, a calm, protected body of water, from May 1st to mid-October. Bask in the sun on our spacious wooden deck while we explore the seafaring village of Mystic, the surrounding islands, and historic lighthouses. Pass through the Mystic River Drawbridge, which opens for the Argia with every cruise. We offer complimentary snacks and lemonade, but feel free to bring your own picnic and beverages as well. Wine and beer are permitted. Enjoy a half-day cruise, or experience the romance of the sea at twilight with a sunset cruise. You will be treated like royalty at the Spa at Essex, where experts perform seemingly magical therapies and treatments on sore muscles, tired skin and drooping spirits. When you enter the property, you are greeted with warmth and bundled into comfortable robes and overstuffed chairs (including chairs for two) while you wait for treatments like massage, facials, manicures and pedicures, makeup and more. Innovation treatments bright aging or troubled skin. Couples, mothers-to-be, and gentlemen can enjoy refreshing and energizing treatments for their particular needs. Customers exclaim over the cleanliness of the indoor and outdoor spaces, which include a sunny patio with a fountain. Specials like the flower facial and the South Seas body treatment with tan will bring you back over and over. 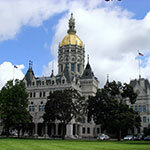 Learn about the Connecticut River – or sail on it! 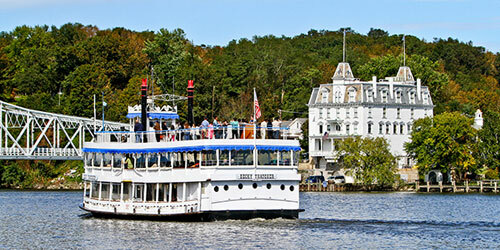 – when you visit the Connecticut River Museum, on park-like grounds overlooking scenic and historic Essex Harbor. There’s plenty to see, from models of yachts, nautical paintings and history exhibits to the tools used in early fishing, hunting and trapping to a vertical, three-floor river mural that goes up a staircase. 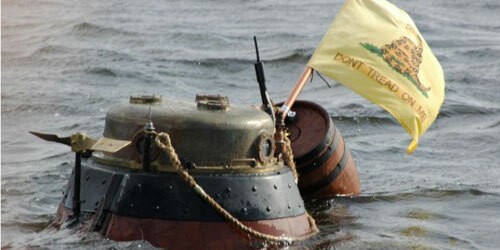 And there’s the model of the Turtle, the Revolutionary War submarine. But there’s also so much to do: rent a canoe, kayak or paddleboard and paddle the river’s coves right outside the museum’s doorsteps, go on a winter wildlife eagle cruise to see bald eagles, or cruise aboard the Onrust, a replica of a 1614 Dutch sailing ship. 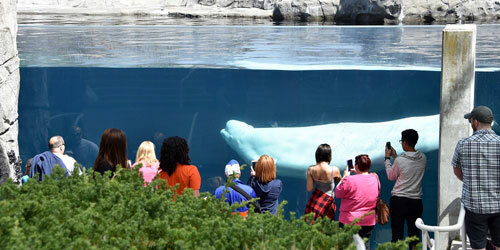 From hands-on interaction with the likes of sharks, stingrays and reptiles to interactive exhibits that make learning about the ocean planet so much fun and even exclusive opportunities to meet animals up-close, it’s no wonder Mystic Aquarium is amongst the most popular destinations in New England. Explore indoor and outdoor exhibits where thousands of animals including whales, penguins, frogs, fish and more act as ambassadors for their wild counterparts. Learn how you can help protect our ocean planet at one of the daily trainer talks and be sure to experience a complimentary sea lion show. Plus, encounter animatronic dinosaurs that practically come to life in ‘Jurassic Giants’! Enjoy special events, activities and more throughout the year that make Mystic Aquarium a destination worth revisiting often. SEA more at MysticAquarium.org. 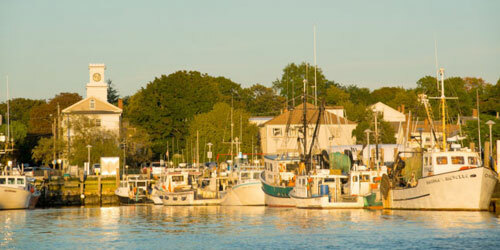 Dotting a mile-long peninsula, this charming seaside village welcomes visitors with a variety of activities from kayaking and paddleboarding to reenactments of the 1814 Battle of Stonington to great shopping and dining. Visit beautiful DuBois Beach at the tip of the peninsula, enjoy a picnic or concert on the lawn of the Old Lighthouse Museum (where you can climb the steps for a fabulous view after exploring maritime artifacts) or tour the Capt. Nathaniel B. Palmer House, once home to the discoverer of Antarctica. At Dodge Paddock, walk around a salt marsh meadow with ocean views; or take a short nature walk along the harbor with amazing views; go sport fishing; or just enjoy a spectacular sunset over the harbor. Get away for the day, overnight or to celebrate something festive. This shrine to relaxation is set in a historic Inn in bucolic surroundings. 42 country acres hold perennial gardens, spring-fed ponds, century-old oak trees, a reflecting pool and an oversized deck welcome you to the spa and inspires a sigh. Thirty-seven treatment rooms offer sauna, steam, hot tub, salon, plus signature services from facials and massage to hand and foot therapies, and even tarot card readings. There’s a fitness center and indoor pool and activities to enhance your health and stimulate the senses. Enjoy special packages including Day Spa and Overnight Spa to Rejuvenation and Personal Escape Packages available on Sunday nights of holiday weekends at a small upcharge. 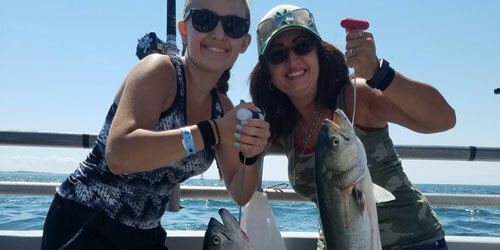 Board a great party boat with an experienced skipper and fish for striped bass, bluefish, porgies, sea bass, blackfish and other delicious food from the sea. Serious fisherman sail on the "Captain's Choice," trips scheduled for the best fishing time and circumstances. Enjoy a night bass trip with no crowds or tangles or a special seal watch, sunset, fireworks and/or nature cruise with science field trips also on the menu. Plan a private day charter of 15 or more and night charters of 12 for your next party or celebration. You can bring your own gear or rent rod and reel. New to fishing? The experienced crew will ensure you have a great day on the water. But do bring your lunch. Then catch your dinner. Reservations are not required and the parking is free. Some things you can do at Ocean Beach Park: Enjoy a pristine sugar-sand beach. Take the kids to an old-fashioned amusement park on the boardwalk with a carousel and tiny trains (and the Scrambler for older “kids”). Play mini-golf. Swim in an Olympic-size pool. Work out in a health club. Go down a triple waterslide. Grab ice cream, a burger, clam fritters – or a cocktail. Play Skee-Ball in the arcade. 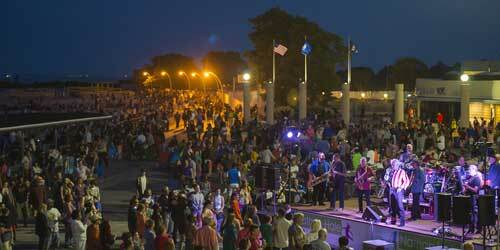 Watch a free beach-blanket movie, catch a band or a magic show. Go on a nature walk. You can even have a wedding ceremony and reception overlooking Long Island Sound, in a gourmet banquet facility – or right on the beach. The Ivoryton Playhouse is a unique theatre with a rich cultural history. 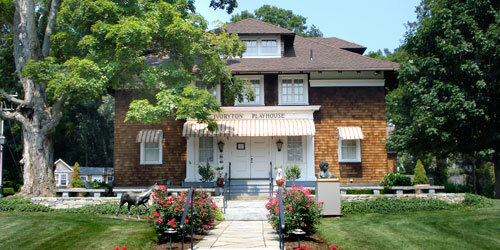 Built in 1911, the Ivoryton Playhouse is the oldest, continuously running, self-supporting summer theater in the nation. Some of the great names of from the stage and screen have appeared at Ivoryton Playhouse including Katharine Hepburn, Marlon Brando, Groucho Marx and Tallulah Bankhead. 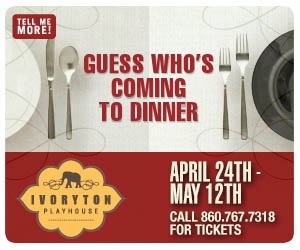 Today, the Ivoryton Playhouse produces a year-round, professional season of award winning musicals, comedies and dramas as well as summer children’s theatre and many special events. Olde Mistick Village, at 27 Coogan Blvd. in Mystic, just off Exit 90 of I-95, is a quirky but really fun place to shop, especially as the Christmas season approaches. 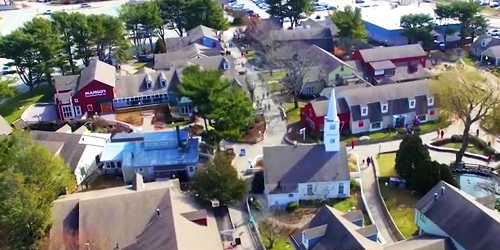 It is an open-air shopping center set up to resemble a Colonial village, complete with duck ponds, a waterwheel and replica of a steepled New England meetinghouse, where performances and special events take place. 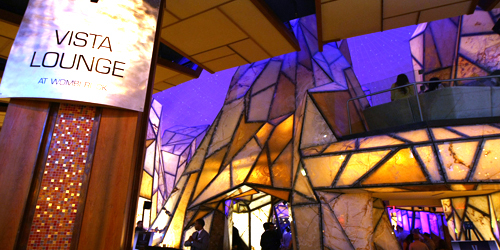 Visitors can wander along brick pathways to our more than 40 stores that sell exceptional gift items from the world over. The meeting house and Victorian gazebo host performances of musicians, dancers, and storytellers free of charge, will bring back the nostalgia of yesteryear. 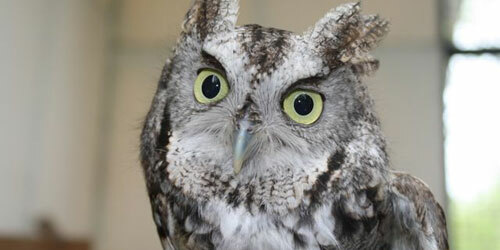 Lots of seasonal events include a fest of lights at Christmas and egg hunts at Easter. 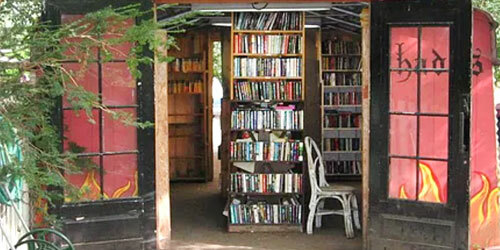 Open daily, year-round. 860-536-4941. Located in the home region of Electric Boat, builder of nuclear submarines, the Submarine Force Museum at 1 Crystal Lake Road in Groton, operated by the U.S. Navy, displays a giant collection of submarine artifacts, documents and photographs, depicting the entire history of the U.S. submarine force history. The "silent service" – you may be stunned to learn – begins with the “Turtle,” used in the Revolutionary War, continuing through to the Ohio- and Virginia-class submarines. 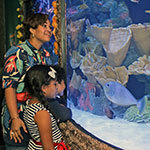 The museum presents various fun scavenger hunts and self-guided tours. Truly fascinating! 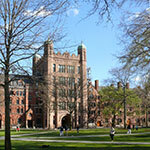 Open year-round, except for a week of maintenance in spring and fall (call ahead). 860-694-3174. Beaver Brook Farm at 139 Beaver Brook Road in Lyme, originally a dairy farm, produces wool, yarn, woolen clothes, cheeses and dairy products, sold at a farm store on the property and at farmers markets. People are invited to visit the farm store for its many cheeses, yogurt, gelato, and raw milk. People who knit will love the woolen yarns and people who love to keep warm will go for the farm’s blankets, sweaters, and warm hospitality. 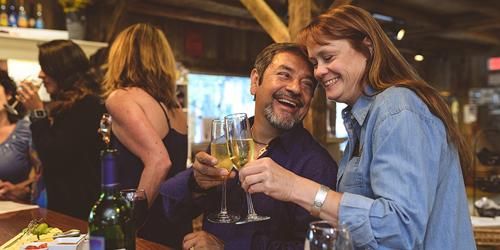 The farm owners welcome visitors and invite you to phone ahead with questions. 860-434-2843. What is a marine national monument? It is a national park – think Yellowstone or Acadia – under water. 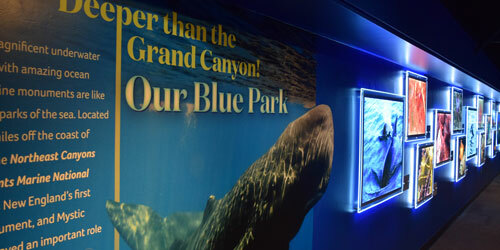 Mystic Aquarium opened in mid-2017 the new Our Blue Park exhibit that is a photographic journey of the Northeast Canyons and Seamounts Marine National Monument in the Atlantic, off the coast of New England. With three underwater canyons and four seamounts, the monument is a biodiversity hot spot. Most of us will never see this national park face-to-face, but the Aquarium offers the next-best option in glorious giant photos. 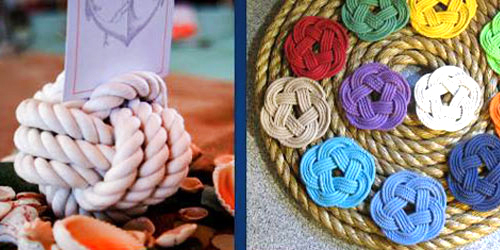 For a sea-themed memento or a gift to take home from your Mystic vacation, a fun choice is the nautical decorations at Mystic Knotwork , with two locations in town, at 25 Cottrell Street and 2 Holmes Street. 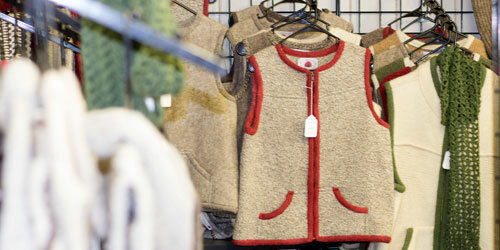 The origins of the store go back two generations, when the current owner’s grandfather opened Beaudoin's Rope Locker. Browse and buy gifts made of cotton rope: sailor bracelets, nautical hair ties and jewelry, décor accents and Christmas decorations, nautical notions for weddings. You’re not vacationing in Kansas anymore. 860-889-3793. 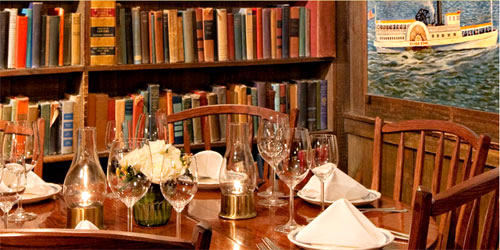 The history of the Griswold Inn in the riverside town of Essex starts in the auspicious year of 1776, when a local ship builder began work on the Oliver Cromwell, Connecticut’s first warship in the Revolution. Essex became a hub of lodging and hospitality for shipyard workers, continuing through an era of steamboat traffic on the Connecticut River, followed by pleasure boating today. You can see this history on the Inn’s walls: prints by Currier & Ives and Endicott & Co.; ship’s portraits; and illustrations by Norman Rockwell. There is a collection of firearms from the War of 1812 and the Revolutionary War. And – yes – the food, drink, and hospitality are still going strong.